The School of Education, University of Nottingham (UoN), UK and Beiwai:Online, Beijing Foreign Studies University (BFSU) Beijing, China have been engaged on a collaborative project to develop a generic module for the training of online tutors as part of the eChina-UK programme. Participatory design approaches have been used within this project to allow potential users of the module to play an important role in the design process. Academics, technologists and tutors from China and UK worked together in small groups over nine months to produce the module materials. Reflective accounts, audio recordings of face to face (F2F) group working and interviews have been used to explore the design process. This paper describes the participatory design approach in this project and explores an activity theory based analysis approach that is used to identify some of the factors that affected the design process. This paper provides an introduction to research into the process of participatory design of online materials for the training of online tutors: etutor training. A collaboration between the School of Education, University of Nottingham (UoN), UK and Beiwai Online, Beijing Foreign Studies University (BFSU) Beijing, China set out to develop an etutor training module for use initially within BFSU, but which was intended to be developed eventually as a set of generic materials for use across the Higher Education sector. Participative design approaches that involve a wide range of professionals, i.e. technologists, academics and etutors have been adopted to support a shared dialogue between the cultures to produce effective etutor training materials. There is much rhetoric about the importance and the value of including potential users in the design of online materials and experience of this process indicates that it is complex and time consuming. However it was felt that the development of the tutor training module would benefit greatly from an involvement of some of the Chinese tutors who would be potentially completing the tutor training module. It was also felt important to develop an understanding of the participatory design process to inform ways of working within the collaborative project and to share this more widely. The research reported here explores the cross cultural interactions among the groups of people involved in the design process. The paper begins by contextualising the research by describing the project, the structure of the tutor training module and the participatory design approach used to develop the materials for the module. An activity theory approach has been used to support the analysis of the data and the paper provides an analysis of two cases of group activity within the project to illuminate the value of this research approach. The School of Education, UoN, UK and Beiwai Online, BFSU, Beijing, China were engaged in a collaborative project to develop an online Masters in English Language Teaching for teachers at tertiary level from 2004 - 6. Details of these Higher Education Funding Council for England (HEFCE) funded developments and the wider eChina-UK programme of which this project was only one part can be found on http://www.echinauk.org . As part of the UoN-BFSU collaboration and as a result of a user needs analysis of potential tutors for the Masters course it became clear that a 'new' approach to tutor training was needed. This resulted in further collaboration by the partners to develop a generic module for the training of online tutors as part of the eChina-UK programme., funded by the institution themselves together with HEFCE. The approach to tutor training that exists in China supports the learning and teaching activities in the course and this has been the approach taken at Beiwai:Online for their current programmes. This tutor training programme like many in China involves face-to-face residential training in orienting the tutor to the nature of the course and their role. At Beiwai:Online there is also an online experiential component to the training which involves an exploration of the materials including an experience of using a discussion forum. The focus of such training is on the orientation of the tutor to the types of activities in which the students are engaged. For example, one tutor training activity involves the tutor in planning a face to face tutorial and another involves how to assess student assignments. These approaches present models of effective practice, which the tutors then follow as part of a course assignment on which they receive feedback. However, a good etutor needs more than this. The challenge is one of helping them understand the concept of "etutoring" fully by developing their understanding of effective pedagogy and strategies for supporting online learners. This needs a new approach to the tutor training curriculum. It also needs a new approach to the design of the tutor training materials to ensure the materials developed are influenced by the real needs of the potential learners. This was the approach adopted by the project described in this paper. Low retention on online courses was felt to be partly due to learner isolation. Computer literacy: An online tutor needs high levels of skill in using a computer and the internet. Communication: An online tutor needs to be an effective communicator with their online learners and to encourage effective communication between learners as well. Interpersonal relationships: An online tutor needs to know how to build effective interpersonal relationship and trust. This was a major concern for these tutors. Supporting new ways of working: An online tutor needs to support the learner in new ways of working, for example learner centred approaches mean learners need to learn how to develop a more autonomous approach to their learning. Knowing how to motivate learners: Online tutors need to understand how to motivate learners to complete the work. The eTutor training module within this project was designed to last for between 10 and 15 weeks and is a mixture of self study and online group work. The structure of the module is described below. The whole module is designed to be completed online, but would benefit from some F2F working in Units 1, 3 and 5. In this unit, tutors have the opportunity to get to know each other and to reflect on their current practice by considering eLearning pedagogy and intercultural working. They are also introduced to the module structure. This unit contains eLearning content from the modules on which the tutors will be acting as tutors. Materials and examples from the MA eELT module have been used initially, but this can be supplemented or replaced by examples from local courses when used at other institutions. Tutors act as learners in this unit and reflect on the kind of support they need from their tutors and establish a better understanding of the tutor's role. Note that most tutors have little experience as online learners themselves and this unit is designed to provide an intensive experience of this. This is a reflective unit and serves as a transition from what they already understand to more advanced training. Tutors need to decide upon a personal development plan (PDP) which sets out the areas they will focus on in Unit 4. Five sub-areas are identified within this unit: Empathy, Cognitive aspects, Methodology, Assessment, Community building. Some of the content and activities are compulsory and others are optional. Tutors focus on the areas they have identified in the PDP in unit 3. Trainee tutors complete a portfolio outlining their achievements as well as their future training needs. This serves as a transition to their working as an online tutor.. Pilot versions of units 1 and 2 were set up in the open source online learning environment Moodle. These contained lttle interactive material and were basically text and video based serving as a benchmark of current practice for the project tutors - these were to be subsequently revised for the final version of the etutor training module. The volunteer project tutors were required to complete these units as a preparation for developing materials for units 3 and 4. The online learning experience was expected to help the project tutors reflect on the roles and needs of the learner and tutor in some detail to help them to think critically and creatively about the nature of the training materials that would be needed in Unit 4. These project tutors were to work collaboratively with academics and learning designers and technicians and the participatory design approach is described in the next section of this paper. "today, particularly with an increasing interest in experiential and learner centred education, learners are encouraged to take responsibility for their own learning. At the same time, there has been some recognition that teachers and trainers should have an input into what they teach as well as how they teach it. Still, curriculum development has tended to remain the responsibility of a few, an elite group located at the top of a hierarchy. The idea of other stakeholders having a clearly identified role in curriculum development is rather uncommon." "Co-designing with real users in realistic situations and environments helps improve the quality of feedback users provide. Frequent iteration between users and designers reduces misconceptions designers make (in part due to insufficient domain experience)." Participants are usually not trained designers. Consequently they can produce poor designs or feel uncomfortable doing unfamiliar design activities. If participants are asked to start from scratch, it will be problematic. They work better with some scaffolding to direct their design ideas. Users may not be willing to devote time to help build technologies which other people profit from. A key challenge is determining how to interest or motivate participants to help build a product they may not use, and which may take be years from production. The PD process itself has tended not to be the focus of research and it was the intention within this project to develop an understanding of what happens during the PD process. An activity theory approach was used to frame the research and the data analysis and this is the subject of the next section of the paper. Activity theory (Leont'ev 1978; Vygotsky 1978) was used as a framework to analyze the ways individuals work within the project as part of the PD process to design the tutor training module materials. 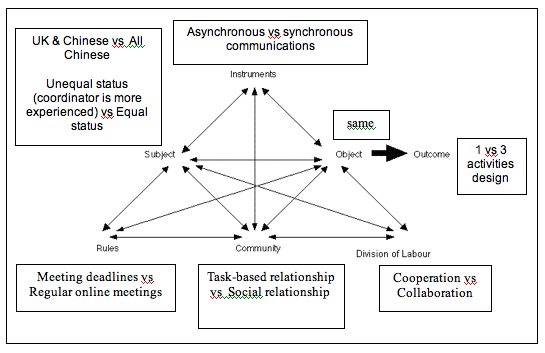 Activity theory is increasingly being applied to aspects of technology-supported learning because of its emphasis on the mediation of tools and social factors on human activity.It has been used in the study of Human-Computer Interactions (Nardi 1996) in research into online collaborative behaviour and distributed learning (Andreassen 2000; Russell 2002) and for supporting the eLearning design process (Jonassen et al 1999). Activity theory argues that an activity is composed of a subject, a person or a group engaged in the activity, and an object (the objective of the activity), mediated by a tool. The mediation can occur through the use of many different types of tools, e.g. material tools as well as psychological tools, including culture, ways of thinking and language. eLearning tools might be an online discussion forum, an online or paper notebook or the study approaches that support effective learning. An activity system (Engeström 1987) shown in Figure 1 is a way of visualizing the total configuration of an activity. Consider the model applied to the development of the etutor training module. The object of this work is to facilitate the project tutor with necessary skills and awareness so that they can collaborate in the development of the materials. The outcomes include the intended ones for the tutors such as ownership of the learning process and successful activity completion i.e. development of materials as well as knowledge, understanding and skills and associated ones such as skills development. Unintended outcomes such as possible dissatisfaction, non-engagement can have a negative impact on the process. The instruments may include communication tools such as email, discussion fora, which may be used to support the development of understanding and encourage engagement. The community consists of the project tutors, the academics and the learning designers/technicians who are supporting them in developing the materials. The division of labour determines the roles taken on by the individuals in the PD process. Finally, the rules regulate the use of time, the online behaviours, the measurement of outcomes, and the criteria for rewards (or awards). Two cases within the project are described to illustrate the ways the activity system approach is being used as the framework for data analysis and presentation. In this project, the tutors and academics were divided into five home groups covering the five themes of the module, namely empathy, methodology, cognitive aspects, feedback/assessment and community building. As mentioned earlier all the project tutors were involved in 3 weeks working online completing the induction unit, unit 1 and the experiential orientation unit, unit 2. This was followed by a four day F2F workshop in Beijing where they started participating in the design process for unit 4 and group working was audio recorded. This workshop was followed by a 4 month period of online collaboration within home groups in order to prepare materials for their particular theme. During this time each individual was asked to complete a monthly reflection on the participatory process. At the end of this period they were also interviewed at a second F2F 3 day workshop in Beijing. In this study, two home groups (named Group A and Group B) have been selected and their reflections on their online experience and their monthly reflection over a four-month period are analyzed to show the impact on the tutors within the PD process. The results are summarized below. Prior to the project none of the project tutors had been online learners although they all had at least 2 years experience of online tutoring - they were trained to be online tutors because they had classroom teaching experience. They felt that the experiential learning within the project gave them an opportunity to understand online learning and view this from a learner's perspective. In their reflections, they mentioned that they didn't have enough time to complete the expected activities and they lacked motivation. The project deliberately chose not to provide effective tutor support during the online induction in order for each tutor to experience what it felt like to be poorly supported - they unsurprisingly all felt that the contact between themselves and the course tutors running the online induction was inadequate They expressed feelings of loneliness and isolation and wanted more communication .They were critical of the eLearning exemplar materials in unit 2 as they felt that these should be more interactive and stimulating. They however felt that their experience and their reflection on this were useful and helpful in terms of developing a better understanding of the need of their online learners. They were developing an empathy for their students as well a new perspective on their own roles, responsibilities and needs as tutors. The three members (all female) in this group were all Chinese. The two tutors (one female and one male) were Chinese and the coordinator (male) was British. Emails, paper, PowerPoint, Word etc. At the workshop it was agreed that each participant would organise one activity each. The coordinator was to lead on the first activity. The group met online in Skype once a week. Agreed necessary readings and reviewed work that was been drafted before each meeting. At the workshop a design had been agreed for the first activity that involved creating a number of video clips. The group were to use the F2F workshops to develop an overall design and then share the provision of content for this in between these meetings The group set up deadlines for submitting scripts by email attachment for videos to the coordinator. All members contributed equally in this group. The ideas are discussed before they are finalized. The coordinator's role was to organize online discussion every week and summarize ideas after it. All members contributed equally in this group. However the coordinator acted as an editor of all the contributions and finalises the learning design. Due to the frequent online interactions, the members in this group are not only work partners but also close friends. The two male members had strong viewpoints.. The female member acted as a bridge to help them understand each others perspective. Though the group were productive their relationship remained professional. From table 1, it is clear that there were differences in the ways of working and the outcomes between the groups. The following explores some of these differences in more detail as a means of exploring the potential of the activity theory approach to the analysis as well as revealing the nature of the PD process within the two groups. Group A: This group worked collaboratively, i.e. all the major content and ideas for presentation were whole group decisions. They achieved this by synchronous online discussion through Skype. The coordinator took responsibility for putting ideas into PowerPoint files and sending them around to the group members for reviewing and further development. When asked how they managed to achieve the final outcome, they all thought that the regular online meetings were critical. This meant that they needed to be well-prepared for the discussion and so increased involvement and motivation. The pressure created by this approach is greater than when email is used as these can be ignored or simply forgotten due to work or family priorities. Group B: This group worked more cooperatively i.e. they agreed tasks and worked on them separately rather than working on them collaboratively. From April to June, the two Chinese tutors produced the agreed video scripts that were important for the completion of the first activity the group had designed. These were sent to their UK coordinator who then edited these and added his own. He then liaised with the technical developers in the UK to ensure the activity was programmed and completed. In the mean time email communication was infrequent once the agreed task were completed and the coordinator spent time designing an online tool and another activity by himself for use across the whole module as well as within the unit. This coordinator was also the project manager and took responsibility for leading the project conceptually and the activity that was developed was as a result of this wider working. However this did mean that the group were not involved in these developments and it also meant that time spent with the group was limited. "There has been little collaboration this month. I have just got on with developing the unit ... not the best approach but deadlines needed to be met and I had to lead the module and our unit with its conceptual direction." (B1) He chose to move things on to meet deadlines and this approach did not allow time for debating and discussion. Group A: This group thought that they were "very flexible" (A1,A2, A3) in their approach. The theme was new to all of them but they were happy to read background materials to develop their understanding in order to produce effective materials. The group were all of similar age and personality. They described each other as very considerate. A2 is a new mother so A1 and A3 were very supportive. They chose the time for online discussion that was suitable for A2 and they also took more of the workload so that she could cope. A2 on the other hand was very active in providing new ideas and feedback. A3 was very busy but would try her best to meet with the others online. She said that she "delayed other work but stuck to the timetable set up by the group because I didn't want to let anyone down when discussing online"(A3). She wanted to contribute and managed to do so by working very hard. The atmosphere in this group was described as very friendly and the participants described themselves as becoming 'close friends'. As A3 reflected "we not only talk about the project, but also show much concern about each other's life. In this way, we try to support each other mentally to continue working hard on this project." There was frequent communication among the group and this was quite open and informative. A2 and A3 had no chance to work with the technologists directly as these were all in UK, A1, the coordinator worked in the UK during this period and reported to the other two members all the suggestions and questions the technologists made each time she had a meeting with them. In this way, A2 and A3 were always informed about the progress. Group B: As we can see from the table, the two male members are very strong minded people. B2 reflected on what happened in the workshop and reported that "It seemed to me that both B1 and B3 were trying to persuade the other with his own ideas, both were strong people. I felt if I wouldn't do some coordination work, the two would certainly break up and quarrel." In the end, B2 acted as a bridge and B1 conceded to take a different approach to ensure B3 (the Chinese tutor) felt his ideas were being valued. They all followed B3's approach in their planning. It is important to point out at this moment that the language used for discussion in Group B was English and in Group A this was Chinese. Language was felt to be an obstacle for communication within the project, some of the Chinese tutors felt it was difficult to get ideas across when using English in spite of their relatively high language competence - they were teacher's of English. When B2 acted as bridge she ended up using Chinese to talk to B3 so that she could understand B3's perspective better and help B1 to understand it. For Group B, the only communication method was via email in spite of being an online tutor B3 had not used instant messaging softwaresuch as Skype and this was not addressed in the first workshop. B1 felt "it takes a few days to get a reply". They in fact had relatively few email exchanges. Activity one had in fact been fully designed at the face to face workshop and a PowerPoint prototype had been developed. In effect the technical developers took this and developed the final online activity from this work. However this left the other members of the group uninvolved in any group working. B1 liaised with the developers to ensure the deadline for completion of the activity was met and organising this and other project work meant that he was hesitant to start developing anything new. B2 also felt B1 was busy and she said "B1 is responsible for the coordination work and busy getting the videos done, I just visited the Moodle websites, waiting for further instructions." B2 seems to be a little passive as she waited for further instructions, but she would visit the websites which means she was willing to do more. However, B1 has "a feeling that my group will be waiting for me to move things on and I can't really do any more than I am doing and in fact at present there seems little that they can do – this needs thinking about during the Beijing workshop (the later meeting) – rethinking ways of working." The coordinator realized that their way of working was problematic and a new approach needed to be adopted so that the group members can be involved more. B2 in her reflection said that this experience had been helpful in her actual teaching. "One of the group members B3 has interviewed some of his students for the development of the teaching material, and this kind of first-hand information has been very helpful in my teaching. ...when I transferred similar ideas to my students, I got such unexpectedly positive responses from my students." Niether of the project tutors B2 and B3 had thought about the theme they were working on before the project and didn't realize it was closely related to online teaching. From the participation, they felt they had understood the theme better and had broadened their view in this area. A3 started to look at her teaching practice in a more critical way. "I think the textbook I am using now for the online teaching is not suitable. Because there is little difference between those used in classroom teaching. In my opinion, online teaching materials should be designed by integrating online activities into the course. These online activities will be achieved in the online learning community, which should be assessed and serves as an integral part of online learning." Both A2 and A3 said that they had benefited from the process of designing the activities for the module. This was because they had the opportunity to talk to their colleagues so that they had a better understanding of the concerns and problems other tutors have. They also thought that their creativity had been improved and that this would influence their future teaching. If we summarize the key differences between these two groups into the activity system triangle, it looks as shown in Figure 2. This shows that the activity system approach to analysis can be useful as a way of presenting the dynamics operating within an activity. It also signals issues such as ways of working and communication, interpersonal relationship and language etc that might need addressing to ensure improved participation. Participatory design processes are complex and this approach provides a means of presenting this complexity illuminating the interplay of factors that shape group working. Activity theory appears to be a useful tool in supporting the analysis of the participatory design process. It helps the researcher frame questions to explore during the research and through the data analysis. Further work needs to be completed within the project described and it is hoped that this will lead to the identification of factors that support effective collaborative design as well as provide an indication of the value of such a process for the participants. The paper has been written at a time in the project when the tutors have just begun the second phase of developments. The lessons learnt from the analysis described above have been shared within the project and the home groups have planned to revise their ways of working, for example, synchronous communication is now the preferred and intended approach for online collaborative communications. This is already an indication of the value of this type of comparative analysis within the complex project described in this paper. In the next four months, the tutors will continue to work with academics and technologists to produce more materials for the module and further data will be collected and the research approach explored more fully. Jonassen, D. & Rohrer-Murphy, L. (1999). 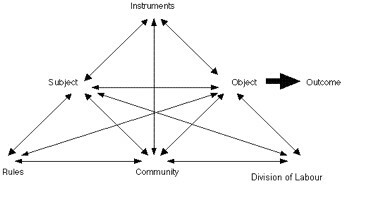 Activity Theory as a framework for designing constructivist learning environments. Educational Technology Research and Development, vol. 47, No. 1, pp. 61-79. Leont'ev, A. N. (1981) Problems of the development of mind. Moscow: Progress Publishers. Nardi, B.A. (ed) (1996). Context and consciousness: activity theory and human-computer interaction. Cambridge, MA: MIT Press. Russell, D.R. (2002), Looking beyond the interface: activity theory and distributed Learning'. In R.M Lea and K. Nicoll, Distributed learning: social and cultural approaches to practice. London: Routledge Falmer. Vygotsky, L. S. (1978). Mind in Society: The Development of Higher Psychological Processes. Cambridge,MA, Harvard University Press.